This book meets the requirements of undergraduate and postgraduate students pursuing courses in mechanical, production, electrical, metallurgical and aeronautical engineering. This self-contained text strikes a fine balance between conceptual clarity and practice problems, and focuses both on conventional graphical methods and emerging analytical approach in the treatment of subject matter. In keeping with technological advancement, the text gives detailed discussion on relatively recent areas of research such as function generation, path generation and mechanism synthesis using coupler curve, and number synthesis of kinematic chains.The text is fortified with fairly large number of solved examples and practice problems to further enhance the understanding of the otherwise complex concepts. 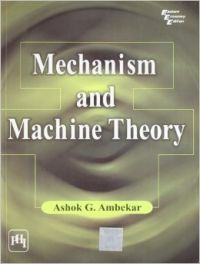 Besides engineering students, those preparing for competitive examinations such as GATE and Indian Engineering Services (IES) will also find this book ideal for reference.This title includes key features such as: exhaustive treatment given to topics including gear drive and cam follower combination, analytical method of motion and conversion phenomenon; simplified explanation of complex subject matter; and, examples and exercises for clearer understanding of the concepts. ASHOK G. AMBEKAR (Ph.D., IIT Delhi) is the principal of Swami Vivekanand College of Engineering, Indore. He has been teaching in the department of mechanical engineering at various undergraduate and postgraduate levels for over 30 years. Dr. Ambekar bagged the N.K. Iyengar Memorial Gold Medal for best paper from Institution of Engineers (India) in the year 2000 and has been retained as the Technical Paper Reviewer of "Journal of Mechanical Design" by American Society of Mechanical Engineers. He has authored two books, including Mechanical Vibrations and Noise Engineering (Prentice-Hall of India). He has also published 19 research papers in journals of both national and international repute.